Yesterday, I had some offline conversations with photographer, +Joel Tjintjelaar. Suffice it to say that Joel’s work has been the source of so much inspiration for me… and countless others, I’m sure. In any case, after having our email volley, I decided to browse through some of Joel’s collection of images. It was enough to get me to work on a simple image I took a few months back while strolling along Portland. A lot of the images that I’ve been taking recently were with the intention of developing more of my own black and white style, as it were. I’m not sure where this road leads but I love having a new side of photography to dive into now. :) Thanks, as always, for the inspiration, Joel. The black and white stylization was done exclusively in Perfect B&W by +onOne Software. I started with the Bogart effect and then tweaked some of the tone sliders to taste. Thats outstanding. reminds me of spiderman for some odd reason…. +Brian Matiash I love that this is your humble and inspired attempt and yet it is so great. :) There are a few things that I just love about this. First off, B&W and the contrast were excellent choices for this image. Plus, you can never really go wrong with B&W with regard to architecture. Secondly, the long exposure to convey the movement of the sky gives the photo such a feeling of long-lasting, or solidarity. Just a lovely effect. Finally, and the leading lines on this photo are stunning. There is sort of this clockwise path for your eyes as one building leads you up to the sky, which in turn (thanks to the motion) brings you to the right of the photo where this lovely diagonal leads you back to the main building. I really and truly mean this when I say that I am instantly reminded of the Cartier-Bresson "Bicycle" photo vis-à-vis those leading lines. 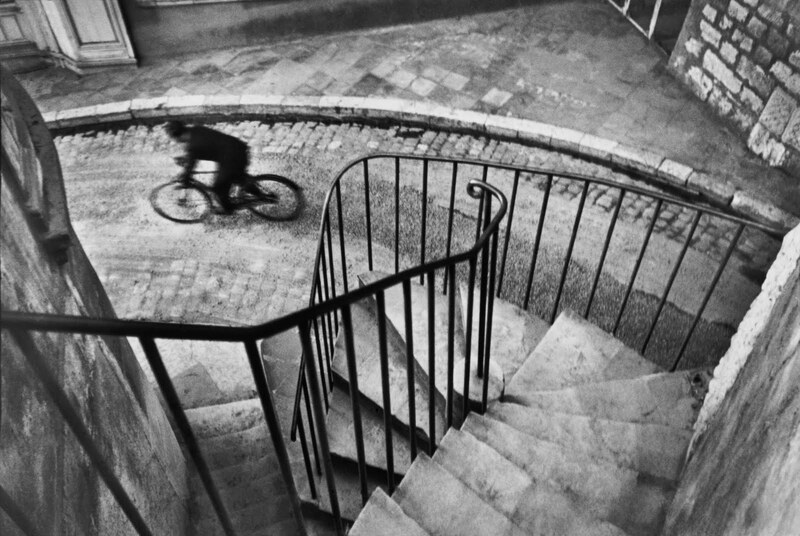 Here's a link to Cartier-Bresson's photo if anyone hasn't seen it. Anyway, a wonderful photo. Just had to share. Stunning image and processing, Brian.